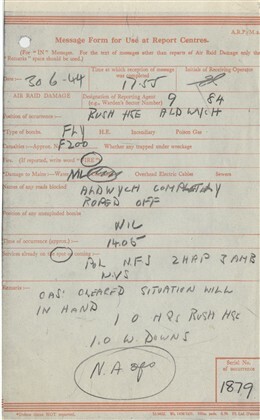 On 30 June 1944, Aldwych WC2 suffered one of the deadliest V1 flying bomb attacks of the war. A fortnight after the first V1 strikes on London, the menacing drone of yet another ‘Doodlebug’ was heard over the capital. 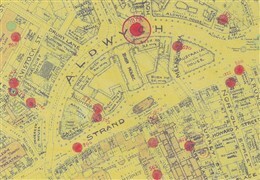 Aldwych - the semicircular street between Kingsway, BBC Bush House, the Air Ministry building (Adastral House) and the Waldorf Hotel - was crowded with workers returning from their lunch hour or queuing at the local Post Office. At 2.07pm the V1 glided silently in over the Thames, diving down to explode on the road between the Air Ministry and the north east wing of Bush House, home to the BBC External Services. 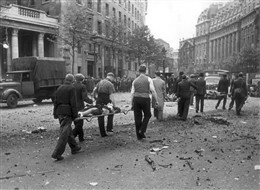 Although the steel-framed Air Ministry absorbed much of the explosion, leaving the buildings astride the roadway largely intact, the blast wave scythed down the street. 46 people were killed and at least 200 others suffered serious injuries. Many of these were inflicted by flying glass fragments from hundreds of shattered windows. Five members of the Women's Auxiliary Air Force (WAAF) died on the upper floors of the Air Ministry. 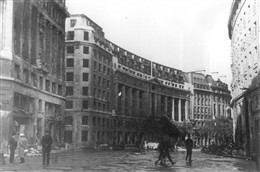 Nearby, Australia House suffered serious damage and the foyer of the Aldwych Theatre was destroyed. When the dust cloud cleared, a deep hole was seen gouged in the road surface. Passing vehicles, including two London double-decker buses, had been completely ripped apart. The few trees left standing had been stripped clean of leaves. Banknotes fluttered past. 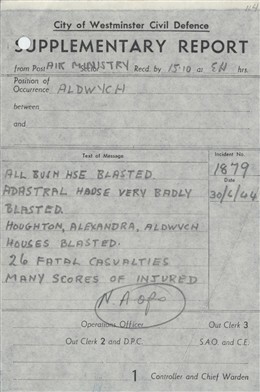 BBC Bush House was peppered with shrapnel. Today, blast damage to the building’s façade and road outside is still visible. Civil defence teams rushed to the aid of the injured, covered up the dead and hosed down the pavements. 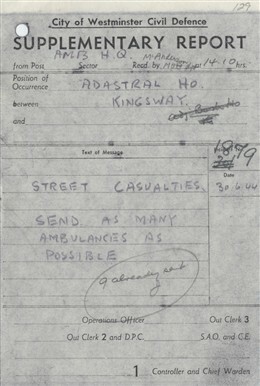 By chance, a fleet of army lorries was parked nearby and these, along with 16 ambulances, ferried the survivors to hospital. A first aid post was set up in Bush House and The Women’s Voluntary Service (WVS) dealt with hundreds of anxious enquiries. 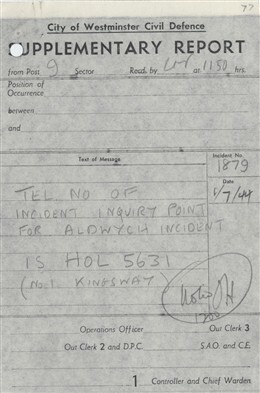 One civilian was treated for a leg wound caused by a flying brass button. The V1 campaign would intensify until late August and early September 1944, when their launching sites in northern France and Holland were overrun by the advancing allied armies. Until then they reaped a grim harvest on London. 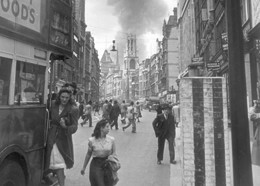 Of over 10,000 V1's launched, approximately 9,251 were fired against London during an eighty day campaign. 7,488 crossed the south coast of England; 3,957 were shot down; around 2,500 hit the capital (in late June 1944 between 50-100 a day). 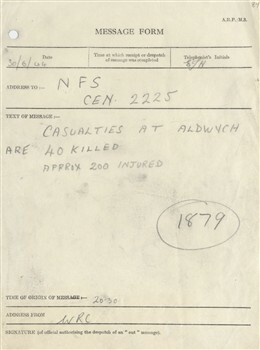 6,184 people were killed with 17,981 injured. 18,000 homes were destroyed by V1’s with 137,000 damaged. This page was added by Camilla Bergman on 15/06/2010.